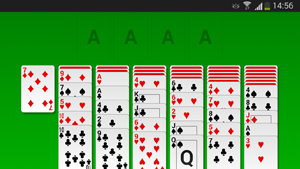 Below are the rules for each of the solitaire game types that make up Solitaire Compendium. Sometimes called Klondike or Classic Patience. It is played with a single pack of 52 playing cards. The object of the game it to build complete stacks of each suit, starting with the Ace and finishing with the King. The cards are dealt into 7 piles, the first containing a single card, the second two cards and so on, with the last containing 7 cards, the last card in each pile being placed face up. The remainder of the cards form the deck. Cards can be moved between piles provided that they are placed on a card which is one higher in number and of the opposite colour. A run of any number of cards can be moved provided that the top card of the run is allowed to move. An empty pile can only be filled with a King. To split a run, simply drag the whole run to the target stack and it will automatically split at the appropriate number of cards, with the remainder returning to the original stack. Cards can be removed to the suit piles at any time, and subsequent cards will automatically follow. The top card of a suit pile can be returned to the playing area if you wish. Spider patience is played with two decks of cards. 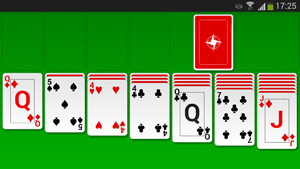 The objective is to remove all the cards from the playing area by building up complete runs of cards of the same suit, which can then be removed. The cards are dealt into 10 piles, 4 stacks of 6 cards and 6 stacks of 5 cards, with the last card on each pile being placed face up. The remaing 50 cards form a pack which can be dealt 10 cards at a time. Cards can be moved between piles provided that they are placed on a card which is one higher in number. 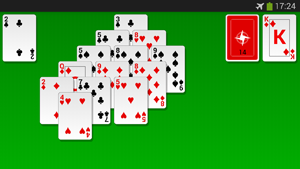 A run is formed when the cards are also of the same suit and any length of run can be moved between piles, provided that the top card is allowed to move. To split a run, simply drag the whole run to the target stack and it will automatically split. Any card or run can be moved to an empty stack. Completed runs are automatically removed from the playing area. Yukon is a variation of patience in which all the cards from a single deck are dealt out. 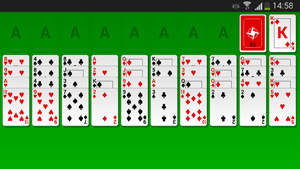 Cards can be moved similary to Solitaire patience with cards in descending numerical order and alternating suit colours. The difference is that any face up card can be moved along with all the cards below it, regardless of whether they form a run or not. Empty spaces can only be filled by Kings. Where a stack contains more than one card that can be moved, grabbing the stack just above the point you want to split and dragging the whole stack to the target will automatically split teh stack at that point. 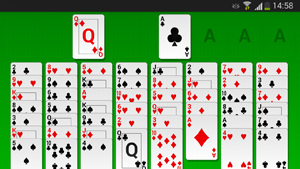 As with Solitaire, the game is won when all the cards have been moved into completed stacks. In Freecell patience all the cards from a single deck are dealt out face-up into 8 stacks, 4 of 8 cards and 4 of 7 cards. The objective is to build completed suit stacks from Ace to King. Cards can only be placed on top of cards one higer in number and of opposite suit colour. 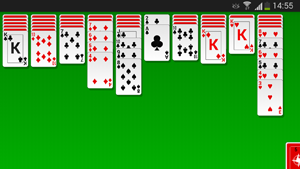 Runs of cards can be moved as one, but the number of cards is limited by the number of free spaces available. In addition to the normal stack and suit piles, Freecell has four "free" spaces that can be used to temporarily hold cards. These spaces also count towards the number of cards you can move as a run. Forty Thieves is played with two decks of cards, dealt into 10 stacks of 4 cards (the forty thieves), with the remaining 64 cards forming the deck. Cards can only be moved onto a card one higher in number and of the same suit. Runs of cards of the same suit form, but can only be moved together if there are enough free spaces. Cards are removed into 8 suit piles, from Ace to King. When one card is moved, any other cards which go will automatically follow. The stacks are scanned from left-to-right, so if you want to remove cards to the right, simply undo the moves back to the point where the card you want goes, then drag it over to the suit pile instead. Any card can be moved into a free space. The cards on the deck can be dealt one at a time, but beware as you can only cycle through the deck once. Pyramid patience is played with a single deck of cards, dealt into a pyramid, with a single card at the top, two cards in the next row, three in the third row, down to seven cards in the seventh row. The remaing cards for the deck. The player matches cards into pairs totalling 13, with a Jack worth 11 and Queen 12. Kings are worth 13 and may be removed on their own. Only exposed cards may be removed, taking either two from the pyramid or one from the pyramid and the topmost card from the deck. So for example a 10 and a 3 can be removed as a pair, or a Queen and an Ace. The game is won when all the cards from the pyramid have been removed.